Not to be confused with Mario and Luigi's family. 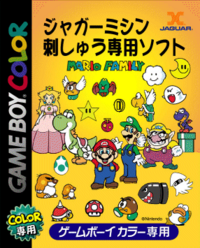 Mario Family (ジャガーミシン刺しゅう専用ソフトマリオファミリー Jaguar Mishin Sashi Senyou Soft: Mario Family) is a piece of software for the Game Boy Color released only in Japan to be compatible with Jaguar's JN-100 sewing machine. The JN-100 came with a cable that would link it to a Game Boy Color, and in the game the player can choose one of several designs that the machine can copy onto fabric. Another more recent model, the JN-2000, also works with a Game Boy Color. The Mario Family cartridge has 32 patterns stored in it; note that, in the case of Mario, Luigi, and Yoshi, the same pattern is copied twice. Players can also alter the colors of the below patterns with a number of alternate palettes. The patterns are pixelated versions of classic-era hand-drawn Mario character/item artworks, created and published for games like Super Mario World. There was a canceled game in the Kirby series called Kirby Family, which also used the Jaguar sewing machine. ↑ Jaguar Mishin Sashi Senyou Soft: Mario Family - GameFAQs. Retrieved February 23, 2015. This page was last edited on November 25, 2018, at 10:02.